This I believe is the boldest article that I will ever write. As much as needed, I stay away from being judgmental especially with sensitive political issues yet a personal experience had taunted me to speak my mind just for the benefit of backing up with the pursuit of peaceful and harmonious relationship within our society. I am here, not just as a free-spirited writer who is paid to write something, or a sister whose brother was stuck in a mountainous region in the middle of a clash against rebels with no food or water supply and with danger at hand. I don’t want to remain muted, sitting comfortably inside the four-wall of our house, not with the recent Mamasapano incident, not with videos displaying violence that caused a massive uproar. And as I grow older, I don’t want to see my son going out the door, fearing each moment of his safety because violence is everywhere. What is it in You? I believe in the greater purpose. And I know that mine is not just to watch things happen and not do something about it. 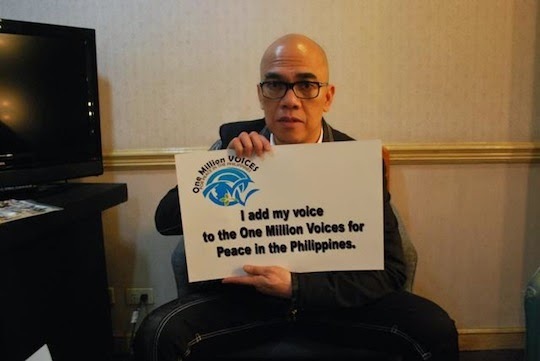 I trust this voice that nudged me, not just to mere babble these thoughts but because of dignity, or profound concern as a member of this human race for this voice to be heard. I believe you have yours to fulfill too. Peace is something that we all are aiming for. Therefore it is a concern of the entire country, making peace as a shared obligation. Yes, it is not just my business alone, not just the lawmakers and the government, but it is YOURS, too. What is it in you that you have to join this armed conflict? Can you sleep soundly at night? Do you find peace every time you pull the trigger and shoot someone? How can you do that to your brother? What happened to this passage to “love one another?" Too many people already died because of this separation, of this division. There’s too much bloodshed at both sides. You have even oppressed civilians who are just simply trying to live a normal life because of this twisted ideology. Is this really the life that you want to have? To see fear in the eyes of the children, or to point your gun in their faces just to threaten them with what you think is right? Your advocacy of independence just for handful personal gains is not the answer, it never will…. worst-to kill. Too many people risked their lives just to break the chain of desolation, fear, violence and crimes. Don’t you have a family of your own to go home to? Are you not tired or all this chaos? For what benefit is it? Personal satisfaction? Really? We are of one blood, one nation, one flag brother, why do you hate so much? Mahatma Gandhi once said, “An eye for an eye only ends up making the whole world blind.” What is peace to you? In order for our community to attain it, peace must be seen at least in two forms: A simple silence of arms, absence of war or absence of war but accompanied by particular requirements for the mutual settlement of relations, which are characterized by terms as justice, mutual respect, respect for law and good will. I therefore ask everyone who has the vision of lasting peace to intensify our prayers. Whatever religious sector you belong to, we need a restoration and sincere reconciliation for our country. It might not be an easy tread to work on, but if we are all united into one goal, one prayer, then the vision will be possible. We don’t want to live every day incessantly looking behind our backs because we feel unsecured. Let’s give justice for those who have their lives to put an end to the fear and violence - that we truly are worth dying for. We all have hearts, and so is our conscience. Let us start mending the broken past and to entrust the Lord for the peace and forgiveness to reign and for another story of love and unity instead to prevail in our society. Just like what Lennon had penned: "Imagine all the people living life in peace. You may say I'm a dreamer, but I'm not the only one. I hope someday you'll join us, and the world will be as one.” Peace is possible, even at broad daylight—it can be a reality…not just a lucid dream.